Berlin, January 29, 2015 – The Document Foundation is pleased to announce LibreOffice 4.4, the ninth major release of the free office suite, with a significant number of design and user experience improvements. 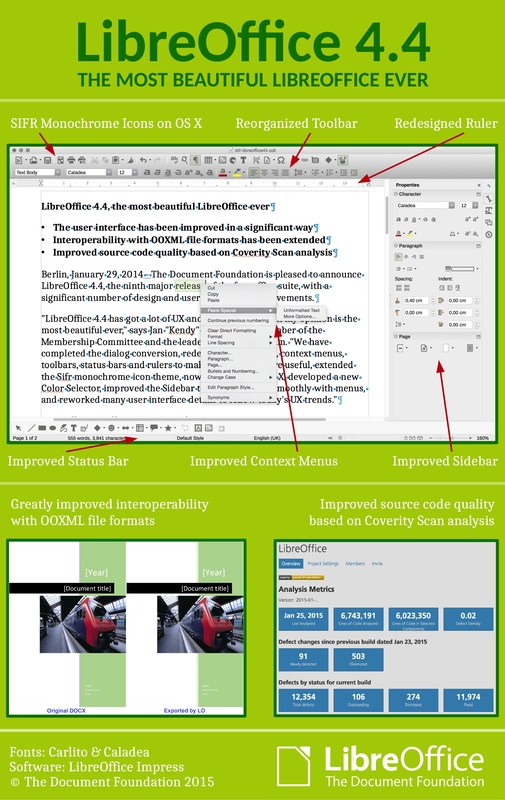 A rather comprehensive description of all LibreOffice 4.4 new features, including developers’ names, is available on the release notes page at the following address: . In addition, a summary of the most significant development related details has been published by Michael Meeks: . People interested in technical details can find change logs here: (fixed in Beta 1), (fixed in Beta 2), (fixed in RC1), (fixed in RC2) and (fixed in RC3). LibreOffice 4.4 is immediately available for download from the following link: http://www.libreoffice.org/download/ or http://download.documentfoundation.org/libreoffice/stable/. LibreOffice users, free software advocates and community members can support The Document Foundation with a donation at http://donate.libreoffice.org. The Document Foundation is an independent, self-governing and meritocratic organization, based on Free Software ethos and incorporated in Germany as a not for profit entity. TDF is focused on the development of LibreOffice – the best free office suite ever – chosen by the global community as the legitimate heir of OOo, and as such adopted by a growing number of public administrations, enterprises and SMBs for desktop productivity. TDF is accessible to individuals and organizations who agree with its core values and contribute to its activities. At the end of December 2014, the foundation has 205 members and over 3,000 volunteer contributors worldwide. The infographics is also available as a PDF. Have tried to download Libre Office 4.4 but there appears to be a fault. Monochrome icons for OSX… What about Linux users? I would like a new icon set as well. SIFR monochrome icons are available in LibreOffice for Linux, although they are not the default choice. Go to Options and then to View, and select the icon set you prefer. Good to know you can still switch between icon sets, not everyone likes monochrome icons, I find them too boring. Awesome news! :) Thanks to everyone involved and to those who supported the project. Any news on when the 4.4 PPA will be available on Launchpad? Looks like there’s still problems – none of the links on are working. I tried a couple different browsers to confirm. Any ETA on fixing this? @ccribas – The torrent link on the download page isn’t currently working however. Reblogged this on Jürgen's Apfel Blog. Still no ribbon, and still the same UI. Thank you very much. Looks like a very strong release. Looking forward to using it today. LO 4.4 is really good and beautiful. Thanks!!!!! Uso Linux Mint 17.1 KDE. LibreOffice se actualizó automáticamente a la versión 4.4 sin problemas. Primero es necesario agregar el ppa:libreoffice/ppa mediante “sudo add-apt-repository ppa:libreoffice/ppa” (sin comillas). Luego ir al Gestor de actualizaciones y ahí verán la nueva versión y el paquete de idioma listos para instalarse. LO 4.4 es realmente bueno y hermoso. Gracias!!!! !